When I shop for clothing, I research and find the best possible ethical options, and it occurred to me recently that I consume news in a similar way. It’s taken a lot of time and effort to become a well-versed ethical consumer, and this habit carries over into my daily news reading. Or, more likely, my news obsession eventually led to a better understanding of how our clothing is made, which started my ethical journey. Either way, I’m convinced that, since I strongly identify as an ethical consumer, I have a responsibility to be an ethical news consumer, too. That means finding and reading reputable news sources with a variety of viewpoints represented, double checking things that might not seem factual, and questioning everything. Just because you read something online or see it on TV doesn’t mean it’s true. 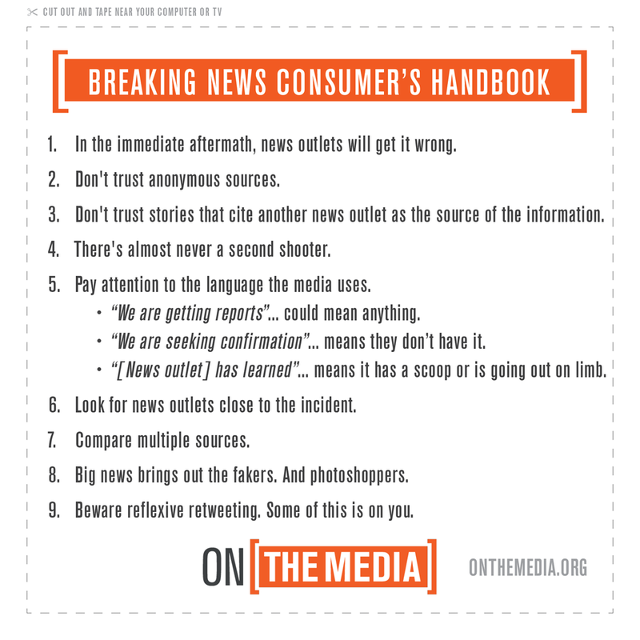 The above graphic from On the Media is a great reference, and its points can be applied to many aspects of today’s news coverage. Over the weekend, I listened to The Texas Miracle Podcast from The Texas Observer. This episode contained three parts: a Texas pastor’s reasoning that Jesus would use the phrase, “Black Lives Matter;” a remembrance of Sandra Bland one year after her death; and a roundtable discussion of several topics, including the media’s misrepresentation of the Black Lives Matter movement. The third segment was especially interesting and explored the lack of objective coverage of the deaths of Black people and the way in which these murder victims are portrayed in the news. Also within the roundtable talk, Christen Smith, a professor from The University of Texas, discussed her theory that the trauma of police violence is slowly killing Black women in less than obvious ways. She recently wrote an article on the topic, and it’s available here. And since his death several weeks ago, I’ve had this story on Bill Cunningham bookmarked. Cunningham was, Robin Givhan explains, the very definition of ethical journalism. In a very similar manner, we as ethical consumers must educate ourselves and seek out news coverage in a fair and ethical way, to ensure that we’re reading and hearing all sides of the story before we form our own opinions. Wow – what a great post. I came on your site to check out your views on some ethical brands but stopped and read this instead! A great and important point to make – and i’m printing off that check lis right now..
Great post. That infographic is really useful! Hi, Summer. Thank you for stopping by.